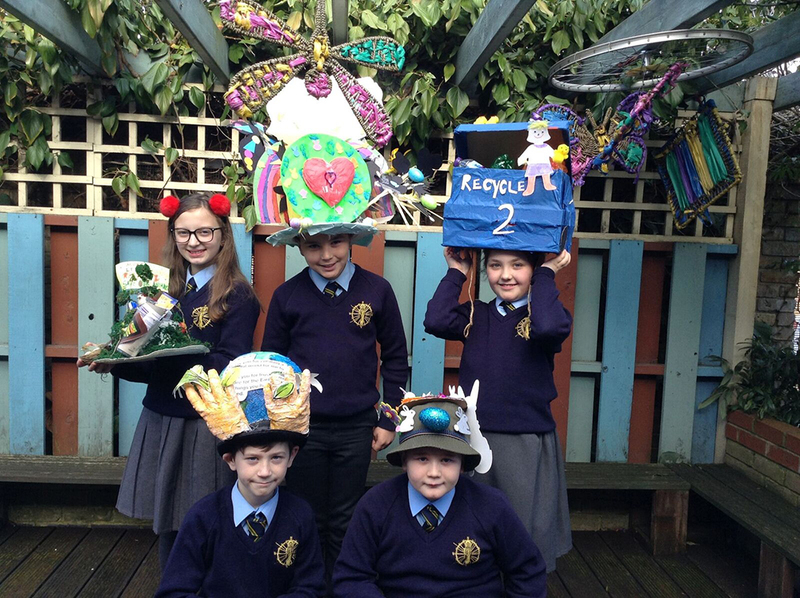 St. John’s school received its fourth Eco School Green Flag Award in March 2016. 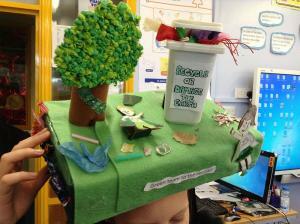 The Green Flag itself flies proudly above the school and is a reflection of what we value as a school. We aim to develop in our pupils an awareness of looking after the environment and this begins in the Nursery, where the children have compost bins for their fruit peel. This is developed throughout the school in the curriculum – with each class studying an environmental theme such as the 3 R’s (Recycle, Reuse Reduce), Climate Change, Water etc. The Green ethos is also developed through the great work of the Green Team. We have a Green Committee and a Green Action team, who work together to organise events for the whole school. This has included Recycling and Upcycling Fashion Shows, Power Down awareness events, Walk to School events, Planting ….. and many, many more exciting events and activities! 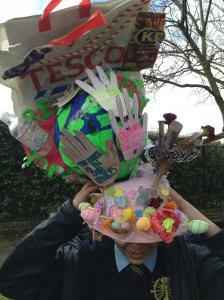 Here are just some of the photographs of the hat designs created on the Caretakers of the Earth theme. 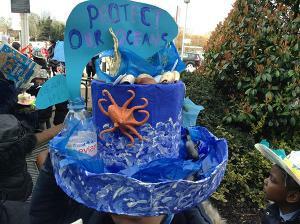 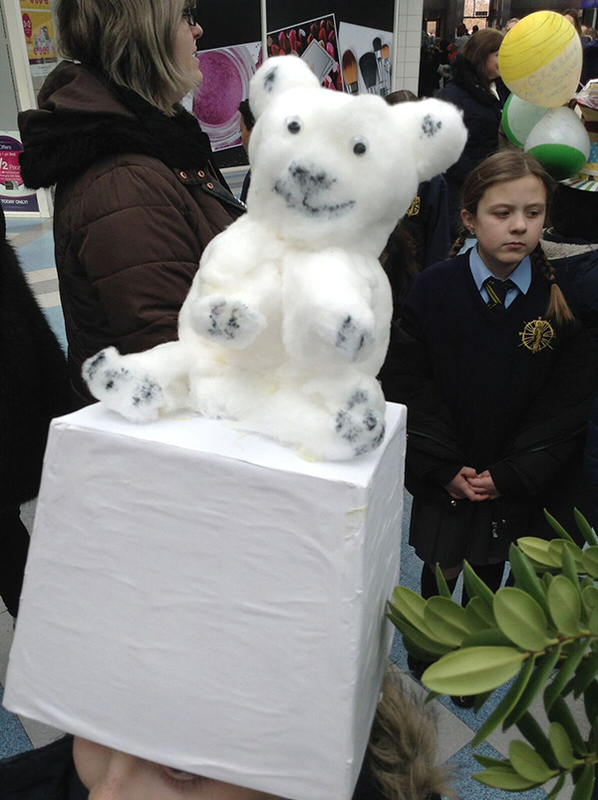 The themes included recycling, reusing and reducing, an awareness of the dangers sea creatures face, the importance of walking nor driving, an awareness of the importance of cutting down on the use of plastic etc. 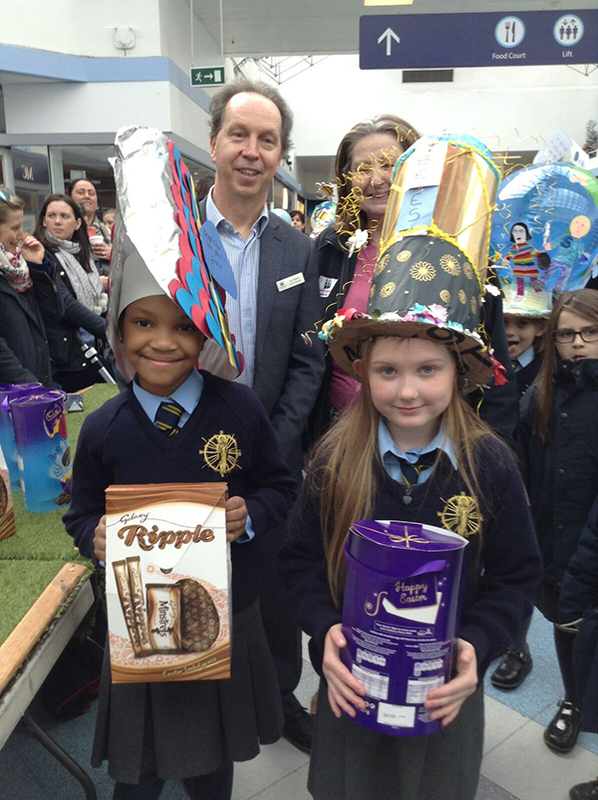 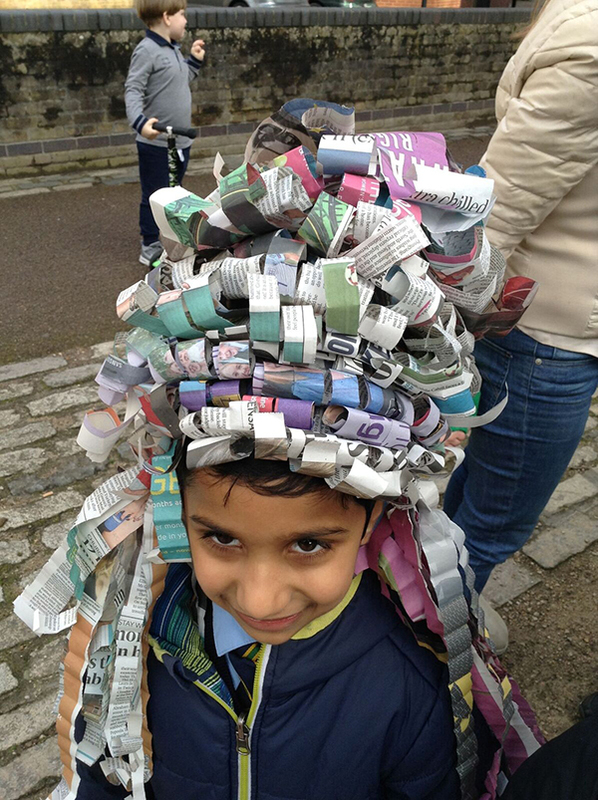 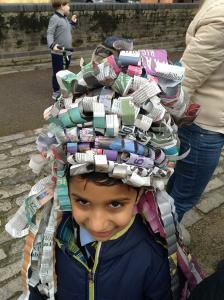 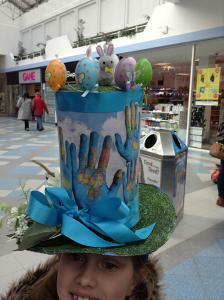 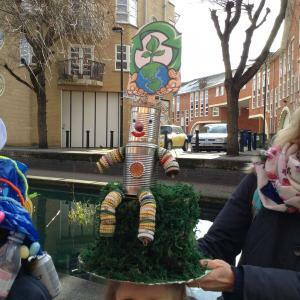 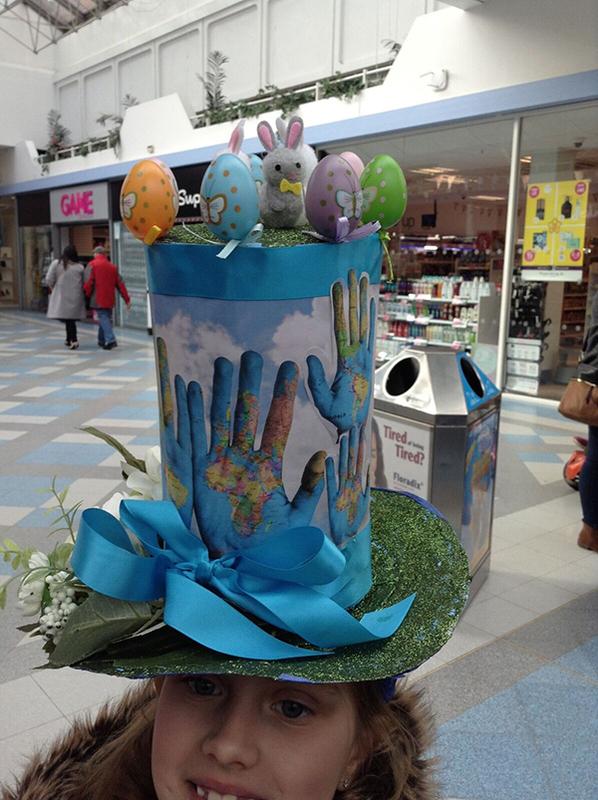 The Easter Hat Parade was a great success – competition was fierce and the creativity was out of this world! 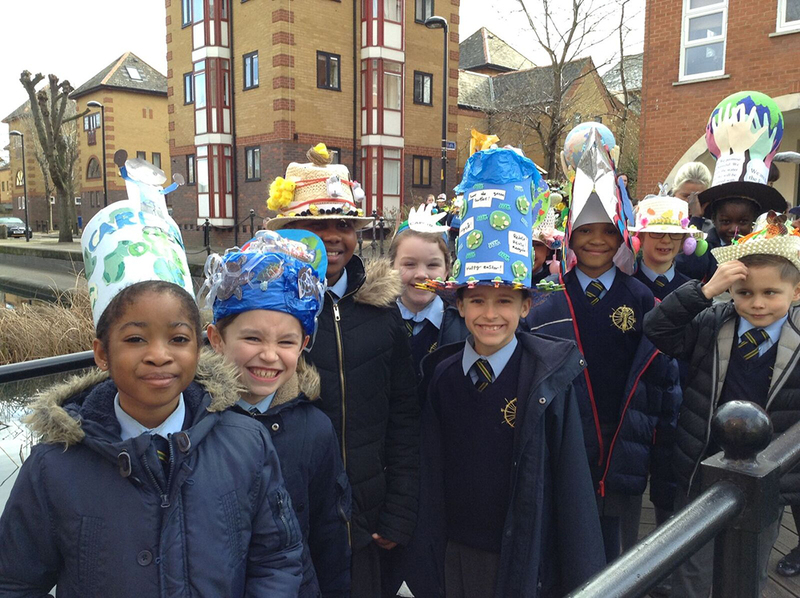 The Eco Team, School Council and Spiritual Life Committee chose CAFOD as the charity for Lent. 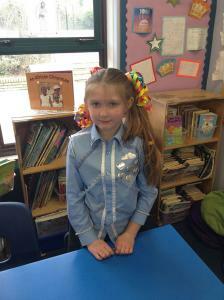 The grand total raised from the ‘Brighten up your uniform day’ and the ‘International Talent Show’ was £402.70! The Government are match funding donations therefore the amount raised will be doubled to £805.40! 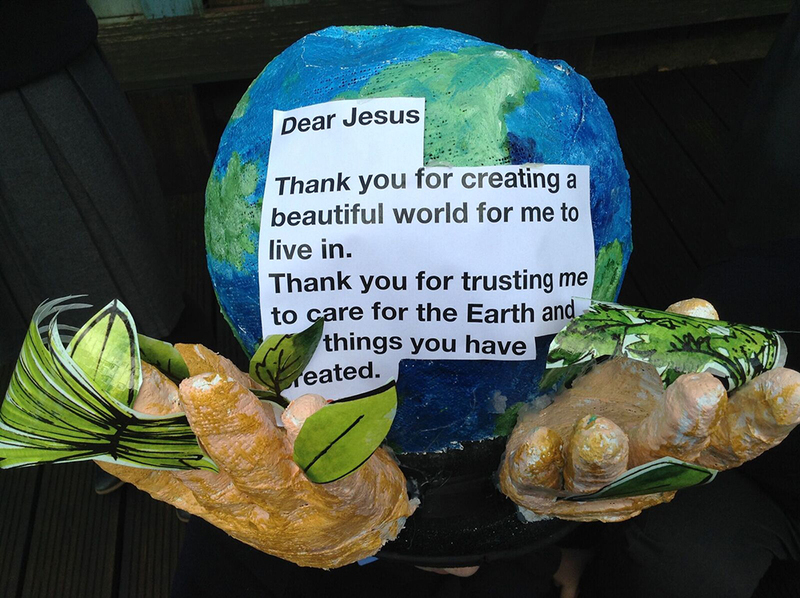 Thank you to all for your support! 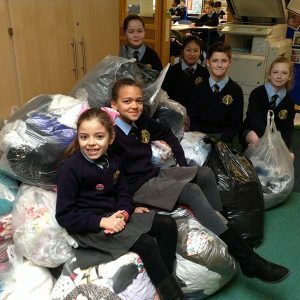 Thank you to all of the families who sent in old clothing for the recent collection for ‘Bag 2 School’. Be re-assured that none of this will end up on a landfill! 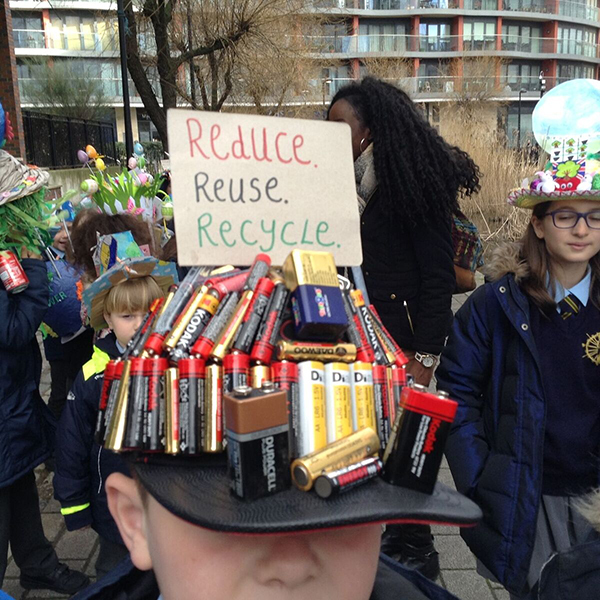 Well done to everyone who has been collecting batteries for the Big Battery Hunt! 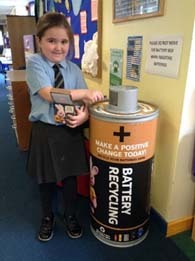 Please continue to collect old batteries and bring them to school – we have already filled 2 containers. 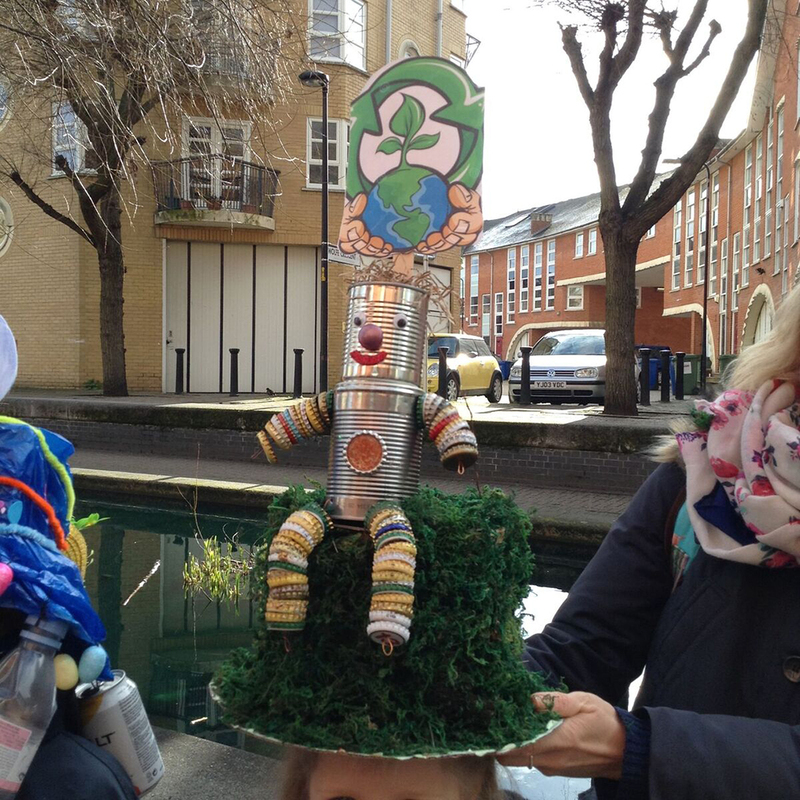 The Eco Active Family Workshops were very successful and those who attended got creative with recycling and enjoyed the experience. 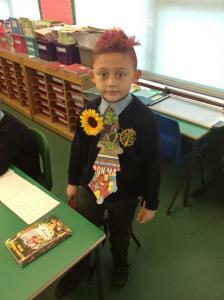 Green Page What wonderful commitment from the families in Reception Class. 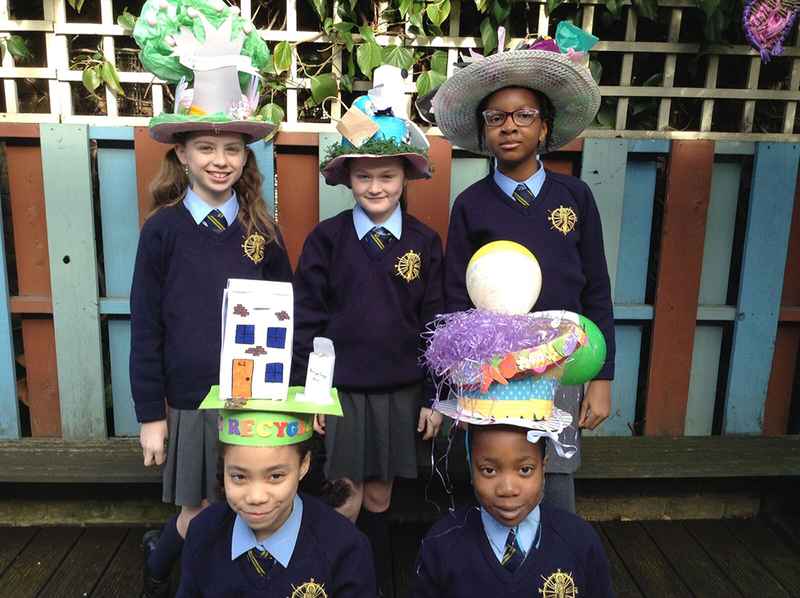 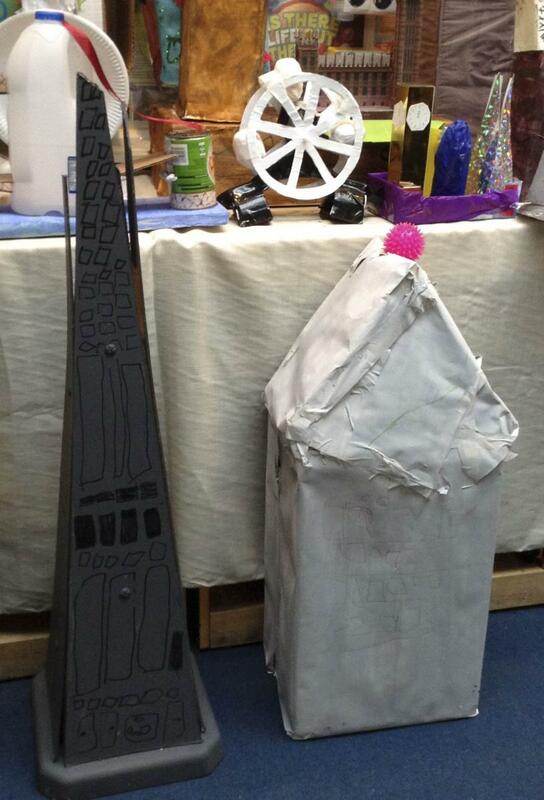 The Homework project where children were asked to make a building from recycled items had a wonderful response from Stave Hill and Surrey Quays to Big Ben and The Shard! The pupils in the school have taken part in a new Shwopping Scheme organised by Oxfam and Marks and Spencer. 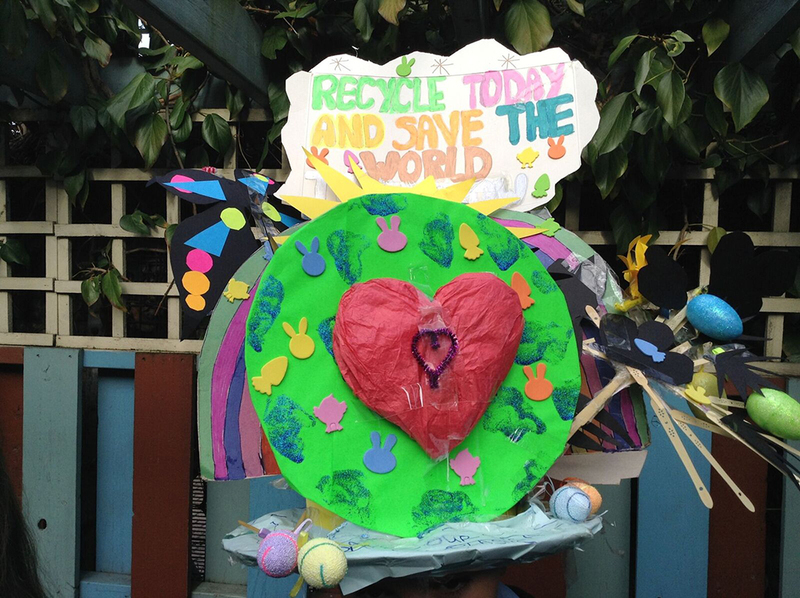 Families sorted out clothes that would go to be resold or reused or recycled – instead of them ending up on the landfill. 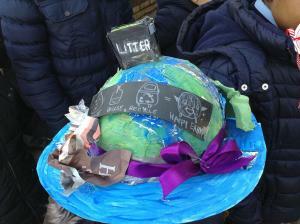 In assembly the children learnt about the importance of this and the impact on our environment. 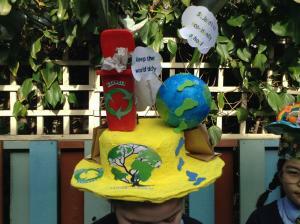 The Green Team organised Bag designing and making workshops during lunchtimes. 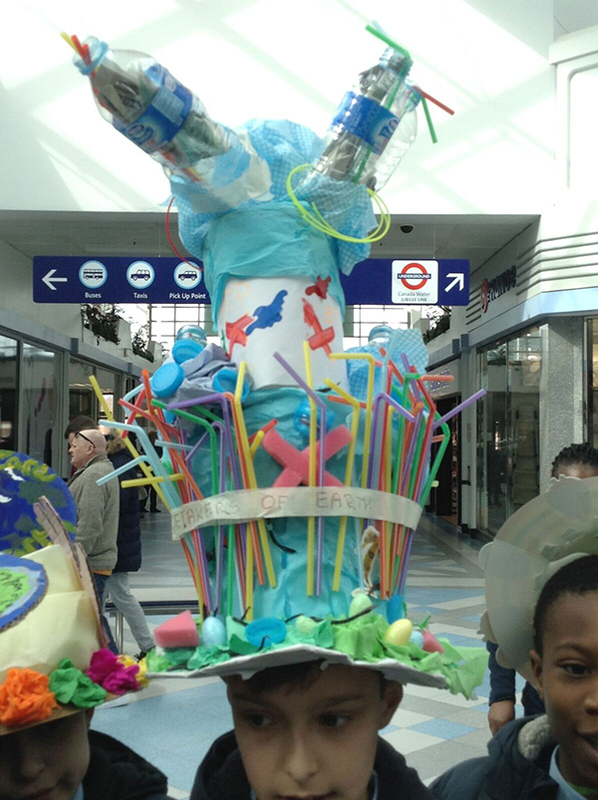 This was following the 5p charge for plastic bags and sought to highlight the campaign to ‘ban plastic bags’. 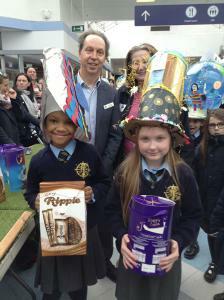 The photographs show the children enjoying the bag making. St. John’s is a WWF Green Ambassador School. This a link to Artist Jane Perkins’ page where the work of Year 2 is featured in the digital Art Gallery on-line. 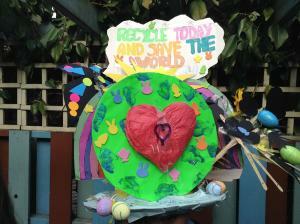 The Art work featured is based on Recycle Art. 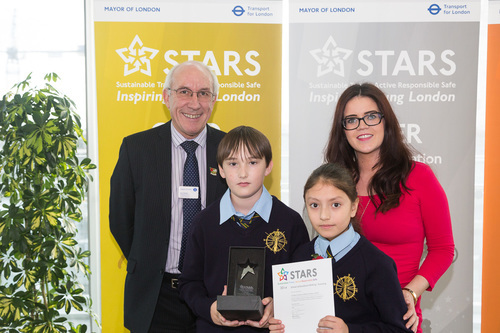 The school was awarded with a STAR Award for the work it does in cycling, scootering and walking to school. 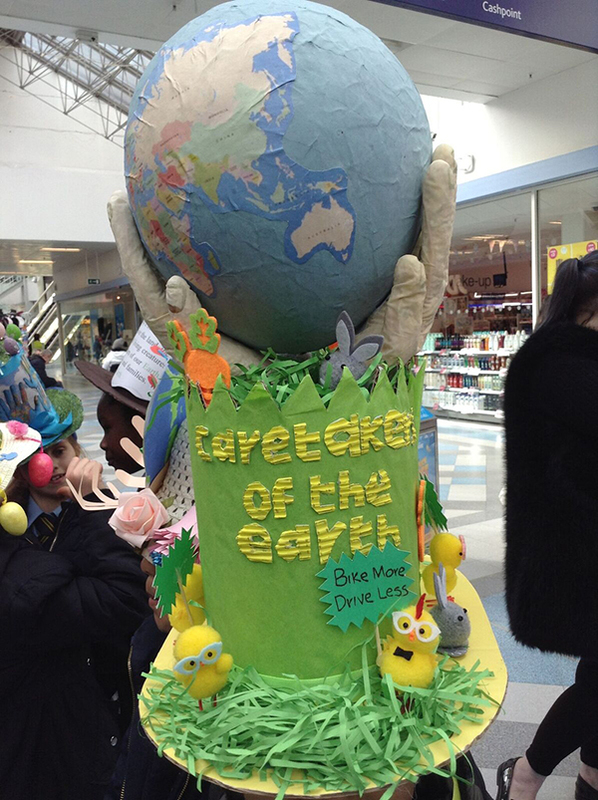 This was awarded at a Travel Awards ceremony – the school has also achieved Silver Status in the Travel Plan Awards. 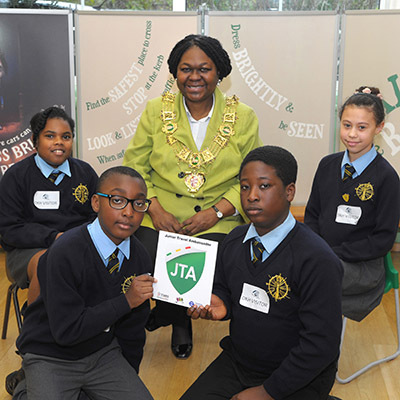 JTA (Junior Travel ambassadors ) Conference 2015 – the JTA’s met the Mayor of Southwark. We have recently begun a campaign to heighten awareness of issues relating to plastic. 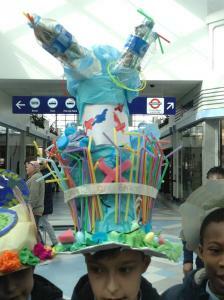 Here are images of some creations made from recycled plastic. As part of the plastic campaign, children have designed fabric bags to be used by their families – instead of plastic bags! Waste Busters – recycling of old clothes etc. 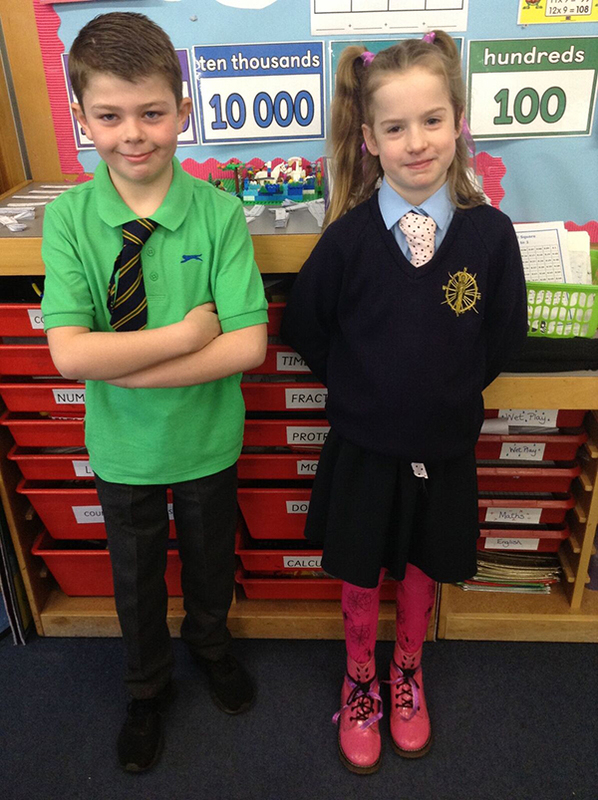 Here are the children who received their Level 2 cycling award recently. Here are the JRSO’s at the Junior Road Safety Officers Conference. 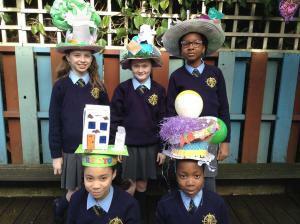 There is a link here to the website of Sacred Heart School in Liverpool. 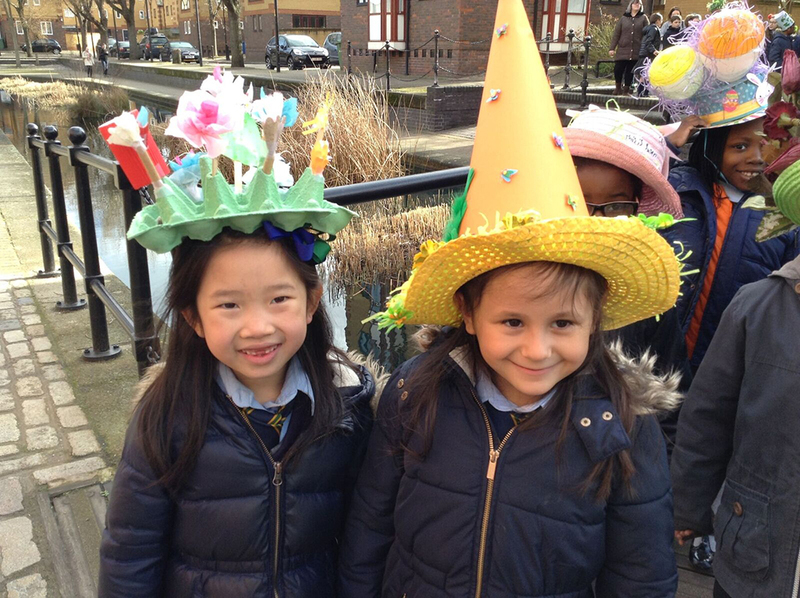 The school Council visited St. John’s School in 2012 and we have since kept in touch, running a joint school project during Big Switch Off Week together. The School Council from Sacred Heart School are visiting us this term! 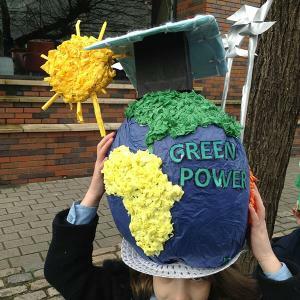 Below you will find a series of images relating to some of the many green efforts our school takes part in. 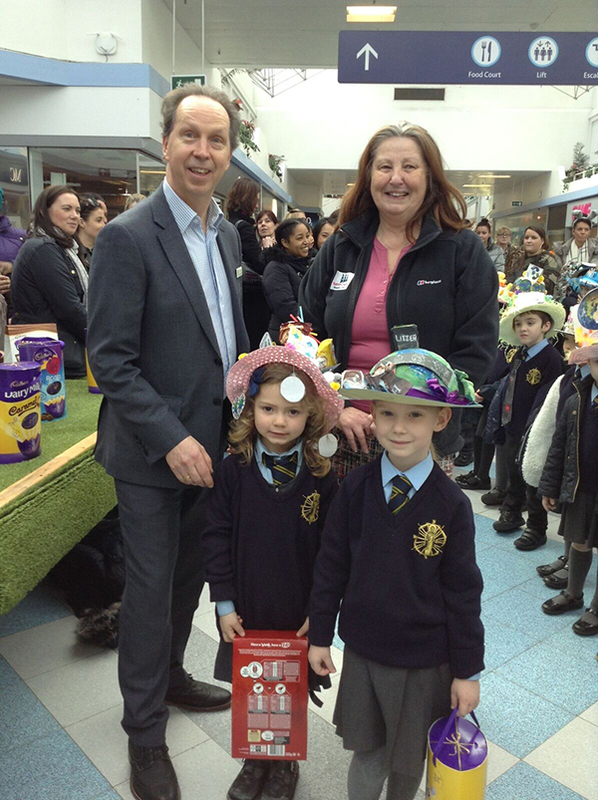 These efforts include sustainable travel plans, planting and harvesting our own produce, and road safety, specifically cycling. 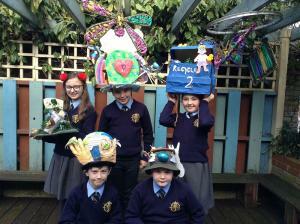 The Green Team were chosen to launch the ‘I love Amazon’ competition at The Rainforest Cafe. 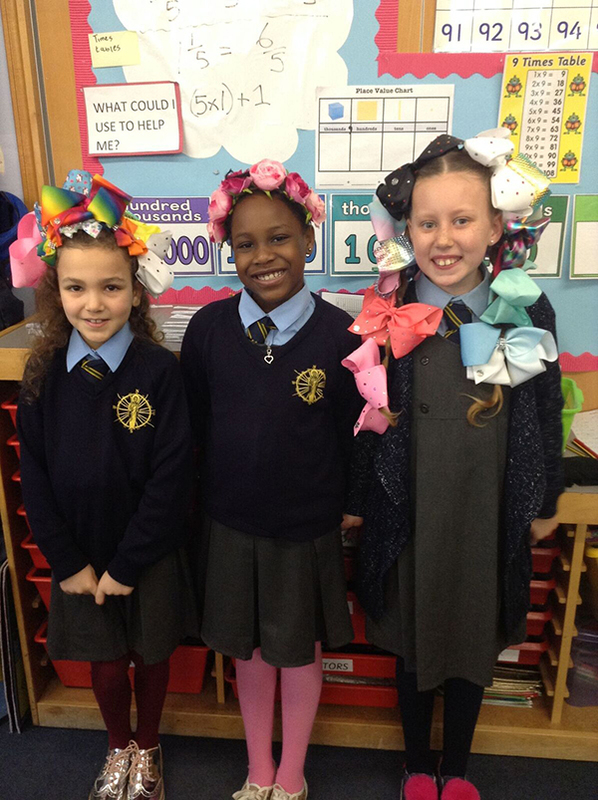 They met and interviewed Charlotte Hawkins – a Sky News presenter! 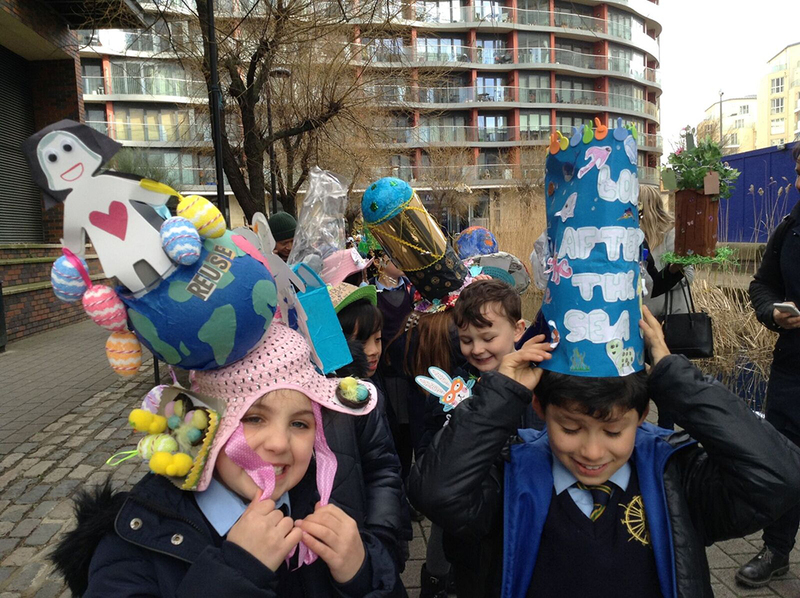 The Green Team went to Borough Market for a special planting workshop with Blue Peter Gardener Chris Collins. The children from St. John’s were given an exclusive invite to take part in the UEFA Football Event 2013 (Stratford) by the WWF.